When your child is a baby, the decorating and design is normally left up to mommy. As your baby gets older, grows to be a little boy or girl and develops their own style, they will want their room to show who they are and what they like. They will want to start to show their individuality, so help them make their room their own! When your little one says it is time to put away the wall ducklings and wood blocks, as hard as it may be, don’t resist and try to talk them out of it! They are trying to grow up a little and discover who they are. Encourage them to think about how they want to decorate their room. Does your little guy like baseball? Is your little girl in her “princess phase?” Maybe they don’t have a specific theme or idea in mind; they just want different color paint in their room or some new decorations on the walls. No matter what, try to let them take the lead and just provide guidance. Spend some time talking to your child about what they want their room to look like. Look at websites or magazines together and have your little one rip out the room photos, accessories, or other items they like. Maybe even take a trip to a furniture store or two – see what they like and what they don’t like. Plus, this will give the two of you time together to work on this special project. If your child isn’t into something specific theme-wise, then focus on the paint and color scheme. Everyone has a favorite color! There are plenty of great color-block room ideas that can give your kid’s room a more “grown up” feel while still obviously being a kid’s room, regardless of the room’s size. Think about painting in color blocks. Paint three walls in one color and consider painting an accent wall in another color. Pick up a simple book case and paint it in the same color as the accent wall. This will help your child create a space that is all their own. Then let them take the next step and have fun deciding what should go on the walls. That’s where the real fun starts! If you or your child has a special photo, thanks to today’s technology, you can take that image and turn it into custom wall art. Did your family go on a special vacation? Maybe there is a special photo that your child just loves with your dog. No matter what it is, take that photo and create a unique piece of wall art from it. Shutterfly can create a piece of art that, unlike photos, doesn’t require a frame to properly display. You can choose from different layouts and backgrounds or just stick with the photo as is. No matter what you decide to create, it will certainly be a unique addition to your child’s new room! Another great design idea is to help your child show off their name. Think about it; when kids get their first bike, they want a license plate with their name, so why not take that idea to their new room? 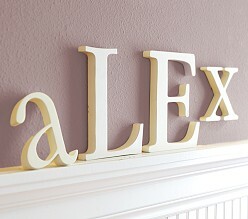 Pottery Barn Kids has a great variety of different letter styles that any child will love! You can purchase them in the color your child likes or you can pick plain wooden letters and paint them with your child as an extra little project the two of you can do together. These are just a few ideas to help spark your child’s creativity. Just give your child some guidance and let them have fun discovering what their new room will look like. And make sure to enjoy this special time with your child!